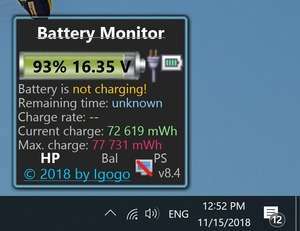 Battery Monitor is a Windows gadget which displays current information about your battery, assuming you're using a laptop or other portable PC. The Battery Monitor gadget includes a few different customizations, namely what type of data is displayed and a couple of graphics-related options along with different types of measurements. Battery Monitor can also be configured to play different sounds when the PC has been plugged in or unplugged. It can be set to play sounds if the battery has reached critical levels. Version 8.7 is a freeware program which does not have restrictions and it's free so it doesn't cost anything. For security reasons, you should also check out the Battery Monitor download at LO4D.com which includes virus and malware tests. Additional screenshots of this application download may be available, too.